Recognize the achievements of your team, and involve them every step of the way! The awards gala: If you become a finalist, the gala brings the program to life for your team as they cheer you on at the exclusive black-tie event, where they can meet influential business leaders. The Company Award Program: If you’re a category award winner, we visit your office or work location to present a granite plaque to your employees. It’s our way of honouring them for their part in your achievements! Tell your story: This is all about one of the most prestigious business awards in the country. Humility has its time and place — this isn’t it. Write your narrative in the third person. It’s easier to be creative and expand on what you’ve done when you write from this perspective. Understand the evaluation process: Focus on the criteria the judges look for. Make it engaging: Your story should be truthful, vivid and engaging. Make it stand out. Have a PR team? Put them to work. Be concise: Keep to the word count. Brevity is a virtue here. Demonstrate results: You can’t measure dreams, but you can quantify growth. Use specific numbers, percentages and statistics. Compare yourself to others: How do you stack up to the competition and differentiate yourself in the market? Convey those factors, remembering that judges may be unfamiliar with your industry. Persuade: Convince the judges that they’re reading about a real winner. Be authentic. Be enthusiastic. Polish and edit: Write it. Take a break. Then go back and read it with fresh eyes, changing what you need to make it shine. Be on time: Nomination submissions are due with a firm deadline of 22 April 2019. How can I nominate an entrepreneur? Starting 1 March, you can nominate an entrepreneur using our online nomination form. All completed nomination packages must be received by EY no later than 22 April 2019. Previous EY Entrepreneur Of The Year Award recipients may be nominated again in a different category in their respective region. Anyone who is associated with an entrepreneur in some capacity (EY professional, employee, banker, lawyer, manager, spouse, friends) can submit a nomination. And you can even nominate yourself. After all, who knows your success story better than you? If my company has locations in different regions, where would I submit the nomination? Given the unique character of the different markets across Canada, Entrepreneur Of The Year seeks nominations in five regions: Pacific (BC and the territories), Prairies (Alberta, Saskatchewan and Manitoba), Ontario, Quebec and Atlantic Canada. The region of your nomination will be determined by the location of the company’s headquarters/head office. Typically, that’s where the business’s owner/CEO/CEO-equivalent is located. This helps ensure consistency for all nominations across Canada. Is there a fee to nominate? What if I don’t have time to complete all the required information? Most times, businesses have established shareholder relations or marketing departments that have already compiled most of the required information. Your company may delegate the preparation of the nomination responses to someone in your organization. If you are selected as a nominee, your commitment will be a two-hour interview on your premises in May, and an evening reception in June to meet the judges and the other nominees. Is the nomination form confidential? Who has access to the financials? All information provided in the nomination form or otherwise will be reviewed by the EY Entrepreneur Of The Year organizers and shared with the independent judges. Financial information (i.e. specific financial information other than information described in a range) will only be shared with the independent judges, who sign a confidentiality agreement and do not retain any documentation, and with the EY principles involved in the EY Entrepreneur Of The Year Awards program. No detailed financial information will be shared with the program sponsors. In our promotional material, we may refer to your participation in the program and include the brief corporate description you provide. Any other public disclosure of information will not be made without your consent. The completeness with which the nomination form is prepared will have a material bearing on whether or not your company advances to finalist status. Is the financial information necessary? Yes, we do need the financial information. Entrepreneur Of The Year is designed to honour business success, so we need measurable criteria. In other words, the company must demonstrate some quantitatively measured success or sustainability. The financial status of my company is confidential and I can’t release this information. Can I still compete? Historically, the majority of nominees have represented private companies with confidential financial information. The limited financial information requested is confidential and the judging process is objective. Financial information will be used to compute growth ratios, return on investment, etc. Please complete the form in its entirety and describe your company growth as accurately as possible. Does my company have to be privately owned? No. If your company went public and the founder/CEO/CEO-equivalent is still active in management, you qualify. If the founder has no equity remaining in the public company, the story needs to be reviewed to determine if he or she is considered a professional manager rather than an entrepreneur. What if our company has multiple founders? Due to the nature of the media announcements and award banquets, it's best to identify one individual who will be the main contact. Multiple-nominee applications are acceptable but must include information for each individual nominee. My company has been in business for over 20 years, and I was not the founder. Would I qualify as an entrepreneur? Entrepreneur Of The Year honours individuals primarily responsible for the growth of the business, whether they are the founder or the current CEO or CEO-equivalent. The intent is to recognize the creativity, drive and hard work of business leaders. If you’re not the original founder, we'll look at what you've done since taking the reins. Many winners have been second- or third-generation entrepreneurs. The awards fall into three main groups: industry awards, specialty awards, and the lifetime achievement award. If this describes you or someone you know, the next step is easy! Submit your online nomination today! The lifetime achievement award honours a person who has made an enduring contribution to Canadian business over many years. This very special award broadens the scope of Entrepreneur Of The Year by recognizing Canadians of such a high calibre that they transcend any specific category award. Past lifetime achievement recipients include Mel Woodward, Ted Rogers, Paul Desmarais, Jim Pattison, Wallace McCain, Laurent Beaudoin, Art DeFehr, William Sauder and Ed Mirvish. How many award categories may I select? Please select the category you feel best reflects the nature of your business. The judges will make the final selection based on the nature, quantity and quality of all the nominated businesses in each region. If you select all the categories for which you qualify, your company will be analyzed for each. The judges will use their best judgment to place you where you will compete best. Who selects the finalists and recipients? 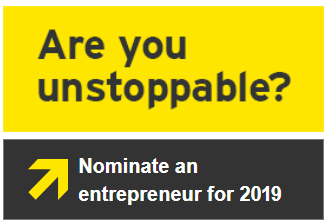 An independent panel of judges comprising fellow entrepreneurs, past EY Entrepreneur Of The Year Award recipients, and leading figures from the business and academic communities will select the finalists and award recipients. Each region has its own panel of judges. What criteria do the judges consider? Financial performance: A strong track record of financial performance, including raising equity and debt financing. Vision: The ability to create a business concept and implement it effectively. Leadership: The focus and strength of character that enable the entrepreneur to move forward — and inspire a team to do the same. Innovation: Driving business success by pioneering new approaches and investing in ongoing research and development. Personal integrity and influence: Knowing that commitment and responsibility aren’t confined to business, and putting energy and resources to work in giving back to the community. Entrepreneurial spirit: Setting high standards and demonstrating a desire to be successful, taking risks and overcoming significant obstacles, and demonstrating perseverance and learning from experience. How much does the overall economic climate affect the judging? The judges always take the general economic climate into consideration when evaluating companies’ recent performance. This year, we celebrate the 25th anniversary of Entrepreneur Of The Year in Canada. And during that time, we’ve seen the inevitable ups and downs of the business cycle. Seeking to celebrate the great things that businesses do, we focus on success. When the economy is emerging from a downturn, entrepreneurs who have shown that they steered through challenges and held their own — or even grown — are worthy of recognition. Entrepreneur Of The Year recognizes tough, determined, resilient people who persevere through circumstances beyond their control. Entrepreneurs are the trailblazers who lead the way and build the future — and are the catalysts for positive change. We celebrate entrepreneurship as the key to economic recovery. In tough times more than ever, entrepreneurs need to be recognized. Why am I asked for a background check? the nominee has a clean history and their business and brand values match those of the Entrepreneur® Of The Year program. © 2018 Ernst & Young. All rights reserved.